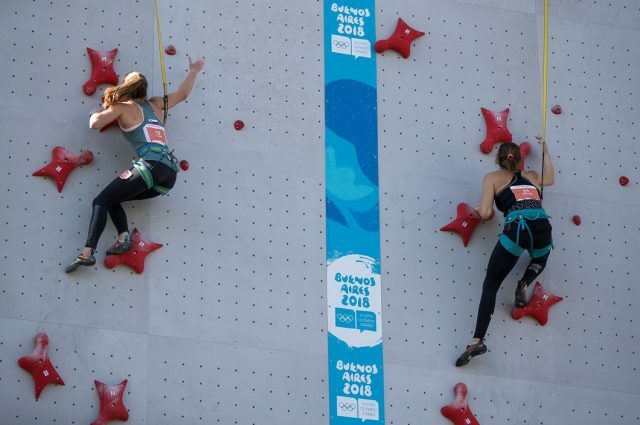 Sport climbing is part of the ongoing Youth Olympic Games in Buenos Aires as a prelude to its appearance on the 2020 Olympic program in Tokyo. But it will not be the first time that Olympic medals have been awarded for climbing. Thus a prize “for the finest climb accomplished since the celebration of the previous Olympiad” was introduced. There was also to be a prize for hunting and Coubertin envisaged “it being completed later by a third Olympic prize of the same kind for aviation”. None of these were in fact awarded until after the First World War. As Paris prepared for 1924, the early meetings of the IOC Executive Commission – now known as the Executive Board – began to talk about alpinism. The Marquis de Polignac informed the Organizing Committee of the decision to include a prize for alpinism. The first Winter Olympic sports week, held in 1924 at the French resort of Chamonix, included what Coubertin called “a moving occasion at the foot of Mont Blanc”. Medals for alpinism were awarded to the members of a team of 21 led by Charles Granville Bruce. Their expedition included the notable climbers George Mallory and Andrew Irvine, and had made a gallant but ultimately unsuccessful attempt on Everest in 1922. A few months after the presentation of the medals, another expedition set out to conquer Everest. This ended in tragedy. Mallory and Irvine died in the attempt. There was a poignant postscript. It came in May 2012, a few months before the London Olympics. Thirty-eight-year old British climber Kent Cool made his way to the summit with cameraman Keith Partridge. They carried with them one of the medals which had been awarded to the expedition from 90 years before. It had been loaned for the climb by Charles Wakefield, the grandson of 1922 expedition member Dr Arthur Wakefield. On his return to Britain, Cool carried the Olympic Torch in Peckham, an area in south London, just a few days before the 2012 Games were to begin. After the first award of an alpinism medal, the members of the IOC asked the Executive Commission to draw up definitive regulations for the award of the prize. That winter, Godefroy de Blonay, an IOC member in Switzerland, was given the job of keeping a record of the notable climbing performances over the course of the next Olympiad. He later reported that he had been in touch with the Club Alpin Suisse. After receiving their responses, he had come to the conclusion that “there was no world alpinism feat that justified the presentation of the prize”. There were suggestions that it might be awarded to a mountaineering club but this was rejected by De Blonay and no award was made in 1928. In August 1931, German brothers Franz and Toni Schmid climbed the Matterhorn by the north face, a feat never before accomplished. They set off before midnight and reached the summit the following morning. Their descent was beset by bad weather, but the party eventually returned safely to Zermatt where they were given a great reception. The German IOC member Theodore Lewald suggested that the alpinism prize be awarded for this achievement. It was, he said, a “remarkable exploit.” Lewald was supported by the Italian Count Bonacossa. This time, the award was presented by IOC President Count Henri Baillet-Latour during the 1932 Olympic Closing Ceremony at the Los Angeles Coliseum. It was received on behalf of the brothers by Lewald as President of the German Olympic Committee, but even before the presentation was made, Toni, the younger of the two, had perished in an accident. That year an Olympic literary prize was even awarded to a book on mountaineering. The Struggle for the Himalayas was by Paul Bauer, later named by the Nazis as the top German mountaineer. He had been encouraged to enter his account by Carl Diem, soon to play a key role in the organization of the 1936 Berlin Olympics. It was in that city that the prize for alpinism was awarded again. The winners this time were a German couple, Gunther Dyrenfurth and his Jewish wife Hettie. When the Nazis came to power and enshrined their anti-semitic policies in law, the couple applied for Swiss citizenship. The decision to award them the prize was taken in Berlin at the IOC Session. The presentation was to take place at the Closing Ceremony of the 1936 Berlin Olympics. Swiss National Olympic Committee President Francis Messerli wrote to them suggesting that “it would be a great honor for Switzerland if you could come to receive the medal”. Unsurprisingly, Hettie was not enthusiastic about returning to German soil. Only Gunther made the trip to Berlin. Their names are recorded on a tablet of honor outside the stadium. Yet the sport of climbing continued to excite the Olympic community. In 1950 Frenchman Maurice Herzog, who later became an IOC member, climbed Annapura in the Himalayas. The summit was 8,091 meters and, had the IOC prize for alpinism still been in existence, he would surely have been a prime candidate. “The expedition was something like a national mission,” recalled Herzog later. “The victorious arrival at the summit is not the memory which stands out the most. Herzog suffered the loss of fingers to frostbite. In 1996, the National Olympic Committee of Tajikistan organised an exhibition in the Pamir Range. Climbers reached a peak at a height of 5,475m which they named “Pierre de Coubertin” in honor of the man who revived the Olympics. In May 2008, the Beijing Olympic Torch Relay made its own expedition to the top of Everest. The final ascent was delayed by bad weather. The Torch was lit by climber Norbu Zhamdu. Nyima Cering, the captain of a 31-strong climbing team, shouted “one world, one dream” as he reached the summit where climbers held a Chinese flag and two Olympic flags. “We have realized a promise to the world and a dream of all Chinese people,” said base commander Li Zhizin. The ascent was controversial and criticized by the Free Tibet movement. The decision to include sport climbing in Tokyo was confirmed at the IOC Session in Rio de Janeiro in 2016. There had been a demonstration during the Nanjing 2014 Youth Olympic Games and a more informal demonstration in Lillehammer during the 2016 Winter Youth Games. The Olympic competition will include three disciplines, speed climbing, bouldering and lead climbing. Each climber will compete in all three with the final standings determined by the combined results. Buenos Aires 2018 will give everyone an idea of what to expect in two years time in Japan. Coubertin would surely have approved. Philip Barker, a freelance journalist, has been on the editorial team of the Journal of Olympic History and is credited with having transformed the publication into one of the most respected historical publications on the history of the Olympic Games. He is also an expert on Olympic Music, a field which is not generally well known.